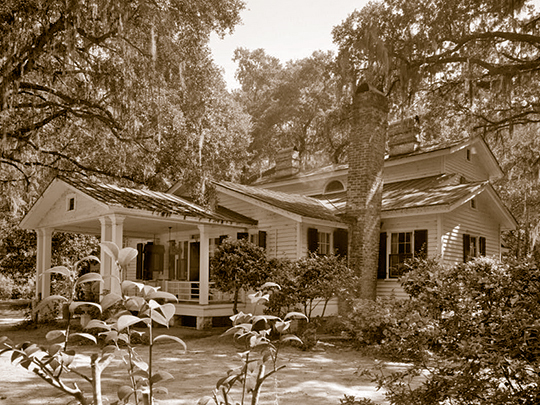 Photo: Wicklow Hall Plantation, ca, 1831-1840, State Route 30, Georgetown, SC. Listed on the National Register of Historic Places in 1978 Photographed by Charles N. Bayless, AIA,, 1977, Historic American Buildings Survey [HABS SC-478], memory.loc.gov, accessed January, 2014. Georgetown County administrative offices are located at 129 Screven Street, Georgetown, SC 29442; phone: 843-545-3063. Native Americans were the first inhabitants of Georgetown County. They were nomadic family groups with names including Pee Dee (coming and going), Wee Nee (black water or dark water people) Waccamaw, Winyah, and Santee. They fished from the ocean and rivers, hunted game in the forest-land, and picked berries and fruits. The first Europeans came in 1526; under the Spanish leadership of Lucas Vesquez de Ayllon, who settled on the banks of the Winyah Bay. By the mid-1600's, English and French outposts sprang up, and trade was established with the natives. The swamps and rivers were home to alligators, poisonous snakes, mosquitoes, and bordered with an impregnable growth of vines and cane. These tidelands were eventually tamed and the rivers served as highways for trade. The Native Americans were eventually conquered and vanished from the area. Artifacts of pottery, arrow points and crude tools made from seashells have been recovered as well as oral legends of the tribes. Georgetown was a busy seaport for imports and exports by 1729. The citizens of the Georgetown District petitioned the King of England to have a port, which was officially granted in 1732 with the arrival of the King's "Collector of Customs." The slow and heavily laden merchant ships navigated close to the shoreline to avoid pirates hidden in the barrier islands. Georgetown County Council, Georgetown County Comprehensive Plan: Cultural Resources Element, 2010, http://www.georgetowncountysc.org, accessed January, 2014.